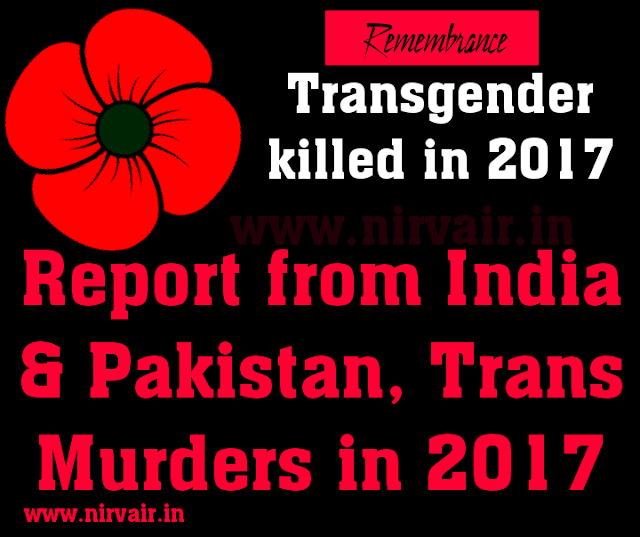 Transgender Murders in 2017, India and Pakistan, the unheard scream. Year 2017, against my wishes I'm writing this few of the confirmed details from India and Pakistan, where Transgender community died of transphobia. Shama, 27, was murdered by her husband Narinder Chauhan in Jalandhar, Punjab, after 11 years of their marriage, she was killed on April 30, 2017, her husband later arrested from New Delhi by Punjab police. Kajal, 40, murdered by her partner with whom she was in a relationship from the last six years in Patna on 29 July 2017 or late evening on 28 July 2017. Later her partner surender himself at police station. Unidentified: Dead body of young Transgender in very bad condition was found in area of Vidyapeeth Police Station, Pune on 27th September 2017. Newspaper advertisements were published by Pune police to identify dead body but no one claim the body and Transgender was remain unidentified. It was a brutal torture murder. Spogmai, 24, was shot in her Peshawar apartment 26th November and later died at Lady Reading Hospital (LRH). The unknown assailant(s) shot her 6 times according to a Gulberg Police spokesman. Amna 35 and Meeno, 26, both khwaja sara Pakistanis were allegedly beaten to death and tortured by Saudi police in Riyad 28 February. Clothing and jewelry was also confiscated by the police. Adnan alias Sufaid, a 17-year-old transgender individual was shot to death in Nowshera District in Pakistan on 8 August 2017. Chanda Sharmeeli, a 30-year-old transwoman was shot dead in Karachi, Pakistan sometime on 30 August or early morning 31 August. 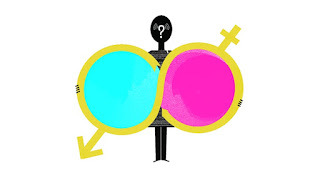 She had been with a gathering of other trans people discussing what they believed to be a recent under counting of Pakistan's trans community when a gang of armed men began harassing them and eventually shooting Chanda. Imli alias Ali Raza, she was murdered by her friend named Adnan on 21 January 2017 in Lahore, Pakistan, her friend slit her both wrist. Adnan was arrested on same day. unidentified, a trans person of about 25-years-old was found decapitated and tortured to death in Peshawer, Pakistan 21 October. They had been dead for at least a few days prior to being discovered.Their body was refused entry to a local freezer for fear of contamination and a government contractor has refused to bury the body. All dates mentioned in above article are of year 2017.